Why we'll never see EMR/EHR interoperability - myths about HL7? Did you hear the one about the EMR vendor who said he could import all your old EMR data because both systems are running SQL as their search engine? Or, should the joke begin: two EMR vendors walk into a bar? Well, what is no joke is why we will never see interoperability and here’s why. Standards get established to allow people to agree on things. 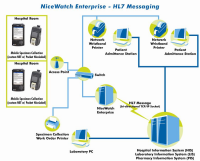 HL7 or Health Level 7 was established decades ago to allow different primitive computer systems in a hospital to talk to one another. This way a ward clerk could discharge a patient and admitting clerk would know, even though they were running different computer databases. A message gets sent saying something like “here comes patient discharge information, it will be the name followed by the ward, room number and discharge yes or no, SMITH Joe, 7E, 724, yes, that was the patient discharge information.” This can get more and more complex and has evolved such that way more information than just within hospital transfers can now be conveyed between different computer databases. Now we can transmit lab results, specifics about history and physical examinations, and more using HL7 standards. What if you don’t get the data definition in your message and all you get is “SMITH Joe, 7E, 724, yes” and it is surrounded by a few hundred other words on each side? Now, you are the computer at the hospital administration office and receive that long string of hundreds of words. You have officially received useless information with gems hiding somewhere in the middle…namely the discharge information that you needed. The data definitions are needed in order for the computer at each end to be sure that the correct data that gets sent from one system is received and interpreted correctly by the other computer. Ideally, this data definition table should be part of the database so that when the data gets sent, the definitions get sent along with them. Well, if you are an EMR/EHR vendor, you may not want just any other electronic medical record to be able to receive your data or your customers could just use any vendor’s EMR they like. So, if you want to send this information to another physician using a different EMR, you either need to both be using the same EMR or have a data conversion program at either end to export the data in a way that it can be received. So there you have it…the reason why we will never see interoperability in EMRs is because there would no longer be any incentive for companies to make their own EMR! By hiding the data definitions within the vendor’s EMR software instead of in the database, nobody can access their data easily. They now have a reason to stay in business so that you can access the data on your patients. Paper charts are more interoperable than electronic medical records. In my case, one vendor says inclusion of the data definitions in the database is part of the HL7 standard and another vendor says it is not and that HL7 only has to do with rudimentary data and is not sophisticated enough for the type of data we need to collect. I thought that yes HL7 is rather primitive but computers just spew out a series of 1’s and 0’s anyway and they can do very sophisticated things. Data definitions are part of the HL7 standard - myth or reality? This is now open for discussion! Please add your comments.